On An Overgrown Path: Is this Mahler's Eleventh Symphony? Is this Mahler's Eleventh Symphony? Back in 2005 a post here looked at the 20th century music that Wilhelm Furtwängler conducted with the Berlin Philharmonic. Among the forgotten composers that Furtwängler programmed was Walter Braunfels, whose music featured in two Berlin Philharmonic concerts in the pre-National Socialism years of 1924 and 1925. Walter Braunfels was born in Frankfurt am Main in 1882. He studied music in Vienna and Munich, and converted to Catholicism in 1918. In the 1920s he achieved considerable success both as a pianist and composer; with the opera Die Vögel (1920) among his early successes, followed by a Te Deum in 1922. His Grosse Messe, modelled on Beethhoven's Missa Solemnis, followed in 1927, and received frenzied applause and lengthy ovation at its premiere in Cologne. But Braunfel was soon to fall from favour: his half-Jewish bloodline marked him out when Hitler became Chancellor, and in 1933 he was dismissed from all official offices and denounced as a composer of Entartete Musik. Following the Second World War his late Romantic style failed to find favour and he died virtually forgotten in 1954. However recent years have seen a minor revival of interest in his music. 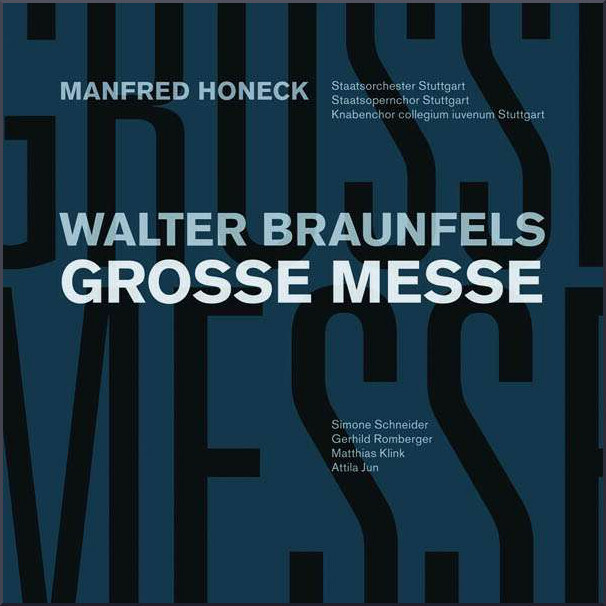 and a noteworthy recording of Braunfels Grosse Messa was made in 2010 at a concert by the Staatsopernchor Stuttgart conducted by Manfred Honek*. Critics at the 1927 premiere of the Grosse Messe commented on its indebtedness to Bruckner and particularly Mahler, and the finales of Mahler's Second and Eighth Symphonies clearly influenced Braunfels. But is that a problem? In my book first rate derivative music is preferable to second rate original music, and there is too much of the latter in today's concert programmes. * Unusually I can find no audio sample of Braunfels Grosse Messa to share with readers. Could a YouTube Law be merging? - the merit of a work is inversely proportional to the number of clips on YouTube. Despite this, details of samples so that other readers can sample the little-known delights of the Grosse Messa would be appreciated. No review CDs used in this post. Any copyrighted material is included as "fair use" for critical analysis only, and will be removed at the request of copyright owner(s). Also on Facebook and Twitter. Is Hans Rott's Symphony Mahler "0" Symphony or probably Mahler "5,5" Symphony ? I certainly don't think there's a problem. The structure and much else of Grieg's Piano Concerto (the one in A minor, I'd better add) emulates that of Schumann in high degree. The Rondo of Brahms' D minor is in structure patently emulative of the Rondo of Beethoven's C minor. However, the wonder of the melodic invention, e.g., in the later works, their composers' own inventiveness in many aspects, put these points out of mind (assuming the listener knows them in the first place). The litmus test re your question might be to ask well-versed music lovers which they would prefer to have firmly placed in their cd collections: the Grieg and Brahms or Paderewski's Concerto in A minor. I have here used the word 'emulative' because 'derivative' carries such a heavy negative connotation, sometimes used with intimations of plagiarism. It is hard to find the best terms for what we discuss here, and I don't claim 'emulative' is much better. Would it not, perhaps, be true to say the Grieg and Brahms were simply inspired by the earlier works? I don't know. But I do know I prefer the Grieg and Brahms to Paderewski and a vast body of other works, including the mass of second-rate works of marked originality. And I would just add that some composers of works of marked originality seem, rather, to have been inspired by Gerard Hoffnung. I must add that Antoine's comment is very well-taken in the context of this discussion. I like the notion of Rott's symphony as the Mahler 0. But rather than deeming it Mahler 5.5, I wonder if we should regard it as Mahler 2, for Mahler used several themes from Rott's symphony in that work and, indeed, Rott's influence on Mahler's later works is something that needs far more attention than it has received. It was considerable. Of course, Mahler's use of Rott's themes in the No. 2 could be called plagiarism, and Rott's influence on Mahler's later works cause them to be considered derivative. I think neither of these views would be valid. The point that most needs to be made is that Rott's symphony wasn't performed until 1989! There are other works of his in archives, and his entire oeuvre should be explored and performed. Re the symphony, I would once have said, "BBC please take note", but we have seen with a vengeance in the sacking of Stephen Jackson that those overpaid panjandrums, minds addled with power, listen to no one. But any orchestra that programmes Rott's symphony, for a start, would show much sense and give their band a boost.